In May 2018, FDA approved LUCEMYRA (lofexidine hydrochloride) as a drug to treat opioid withdrawal symptoms. It contains 4,5-dihydro-1H-imidazole moiety in its backbone, which is quite uncommon for drugs (compared to, for example, imidazole or pyrimidin-2-amine moieties). This fact could not pass unnoticed. 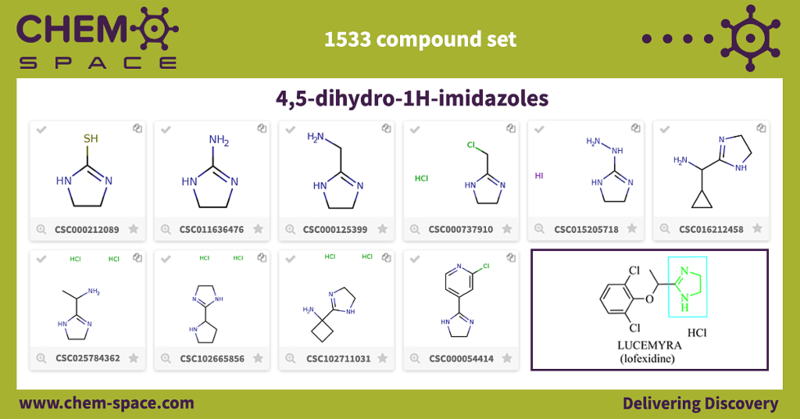 That is why we have prepared a set of 4,5-dihydro-1H-imidazoles and their nearest derivatives to power up your research.